At a period of growth and development like this, it may happen that the press is also interested in the 23 years of success at ParkinGO's home. The franchising programme in Italy, the affiliation abroad and the partnership with GetMyCar are some of the innovations that have updated the face of the first international network of airport and port car parks causing so much to talk about. The secret of this success, as stated in Millionaire magazine, is «to transform the "car service" into a"customer service"[...]. The customer who uses our car parks leaves us the keys. At the entrance your car is filmed by our sophisticated camera system, ParkinGO Scanner, so that it can accurately check the condition of your car up to the smallest scratch. This for us is transparency in the Customer Relationship and together with all the services offered, such as shuttle bus 24h between the car park and the airport, car wash, servicing, tyre change, valet service with car delivery directly at the airport and much more. They might seem ordinary services, but they save people time when the car is parked ». 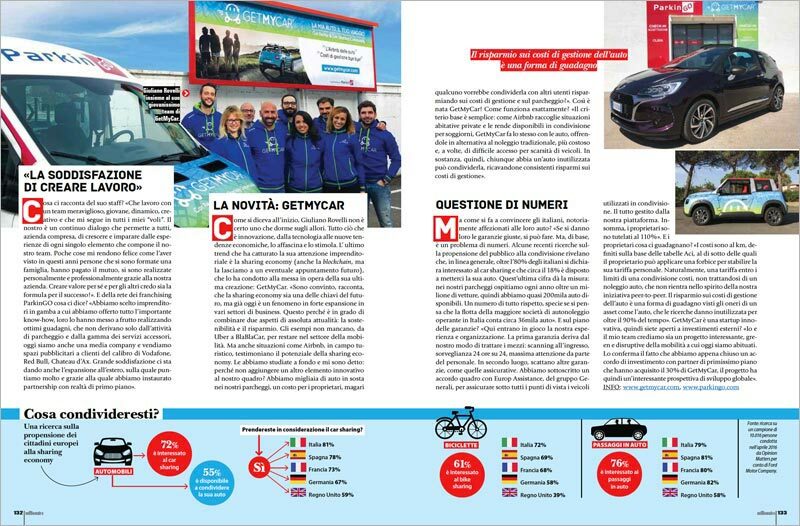 Millionaire, a monthly magazine that focuses on telling the success stories of Italian and non-Italian entrepreneurs, dedicated 4 pages to an interview with Giuliano Rovelli, founder of ParkinGO. The article can be downloaded in pdf version below.